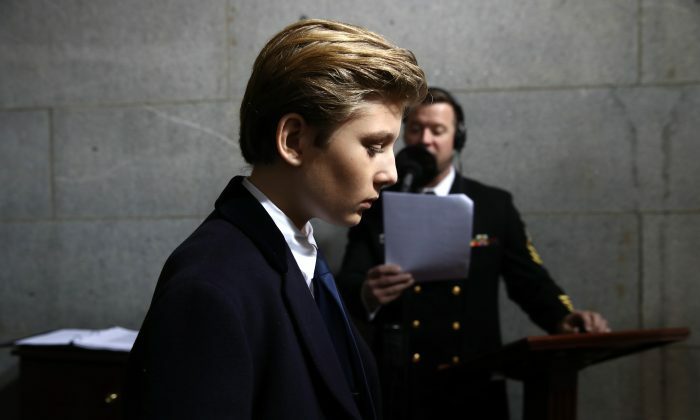 An impassioned defense of Barron Trump, the 10-year-old son of President Donald Trump, has been shared by many after some prominent figures made jokes at the boy’s expense—which many deemed inappropriate. After “Saturday Night Live” writer Katie Rich joked that Barron would be the country’s “first homeschool shooter” on Twitter, users demanded she be fired from her job. The New York Times reported Monday she was suspended indefinitely for her tweet. Melissa Earnest, who describes herself as a Trump supporter, attempted to frame how to treat Barron. “Whether you like or dislike the Trumps – this is their 10-year-old son. He is still growing and words hurt,” she wrote on Facebook in a post shared millions of times. She added: “Do you see this child? This child’s life was changed forever when his father was sworn in as President of the United States of America yesterday. Meanwhile, Chelsea Clinton, the daughter of former President Bill Clinton, echoed Earnest’s sentiments in a social media post of her own that also took a swipe at the president. “Barron Trump deserves the chance every child does-to be a kid. Standing up for every kid also means opposing @POTUS policies that hurt kids,” she tweeted.